The Accreditation Team at The Center for Breast Health at Good Samaritan Hospital. 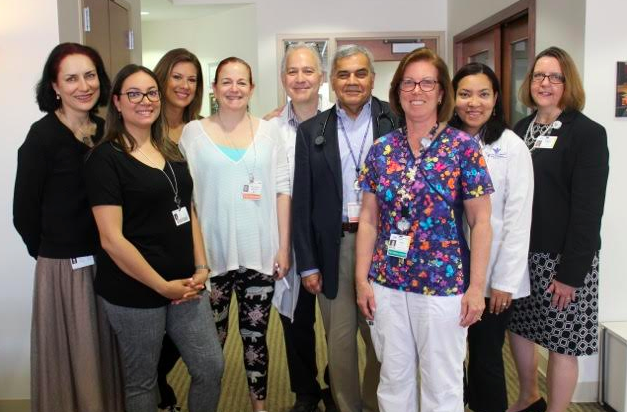 Patients seeking breast care have a high-quality choice for receiving treatment at a nationally accredited program that meets the highest standards for patient safety and quality of care in Rockland County. The Center for Breast Health at Good Samaritan Hospital, a member of the Westchester Medical Center Health Network (WMCHealth), has been granted a three-year full accreditation designation by the National Accreditation Program for Breast Centers (NAPBC), a program administered by the American College of Surgeons. Accreditation by the NAPBC is only given to those centers that have voluntarily committed to provide the highest level of quality breast care and that undergo a rigorous evaluation process and review of their performance. During the survey process, the center must demonstrate compliance with standards established by the NAPBC for treating women who are diagnosed with any type of breast disease. The standards include proficiency in the areas of: center leadership, clinical management, research, community outreach, professional education and quality improvement. A breast center that achieves NAPBC accreditation has demonstrated a firm commitment to offer its patients every significant advantage in their battle against breast disease. The American Cancer Society (ACS) estimated that there were 252,710 new cases of invasive breast cancer and that 40,610 of these cases resulted in death last year. In addition, several women will deal with benign breast disease this year will require medical evaluation for treatment options. Receiving care at a NAPBC-accredited center ensures that a patient will have access to comprehensive care, including a full range of state-of-the-art services, a multidisciplinary team approach to coordinate the best treatment options, information about ongoing clinical trials and new treatment options and most importantly — quality breast care close to home.